Additional authors: Dennis, Peter, -- ill.
Series: Fast forward Published by : Barron's, (Hauppauge, NY :) Physical details: 31 p. : col. ill. ; 28 cm. ISBN:0764153099. Subject(s): Castles -- History -- Juvenile literature. | Civilization, Medieval -- Juvenile literature. | Castles -- History. | Civilization, Medieval. | Castles -- History. | Medieval civilization. 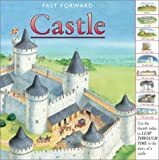 Illustrations and simple text teach young readers about castles; uses a thumb index to show how castles have changed throughout history.